06-Mar-2008 -- This is the 8th point in a journey by motorbike in India to visit 16 confluence points. The story starts at 22N 86E and this visit follows on from 22N 80E. The next point in the series is 21N 79E. Refreshed by our day off we set off early (6.50 am) the next day to try to make up some lost time. The 70 km road west from Seoni to Chhindwhara was quite good and we arrived near Chhindwara at 8.30 am. We had to decide where to turn off the main road in order to cross the railway line. Having crossed it we headed towards the point along ever narrowing farm tracks despite being several kms from the point. We arrived in a small village to ask the way and were greeted by a pair of young tobacco salesmen who spoke excellent English and knew where we wanted to go. Following their instruction we rode a couple of kilometres west and found the confluence road. This special road is the one that leads you all the way to the point – usually it gives you a few nasty moments on the way by veering “off course”, but always comes back to follow the GPS arrow. The point lies 30 metres below the road down a slope. We found a track down and came back to the point. 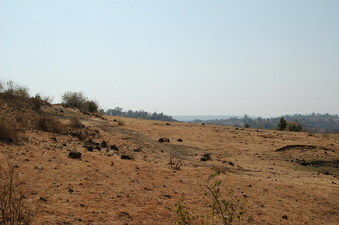 The undulating area is dry and uncultivated scrubland although there are small fields around. The ground is dotted with dark rocks – possibly basalt. This point marked the end of our westward journey as we decided that we should go south and start our return journey. We did not stay long at the point but decided to go NW to Chhindwara to find the road south to Nagpur as there is a large river between the point and the road. The road to Nagpur was excellent and we made good time. Nagpur is a large city and was very hot (by our standards!) although the humidity was low. The story continues at 21N 79E.